Enjoy Softsoap Cucumber And Melon Liquid Hand Soap With A Delightful Scent Inspired By Sunny Summer Moments: Cucumbers On The Vine, A Garden After A Morning Rain, Freshly Cut Watermelon. Awaken You Senses With This Deliciously Refreshing Clean That Smells Crisp, Green And Slightly Sweet. Wash Away Dirt And Bacteria With Its Gentle Cleansing Formula. Hand Soap Comes In Convenient Pump Bottle For Easy Dispensing.. 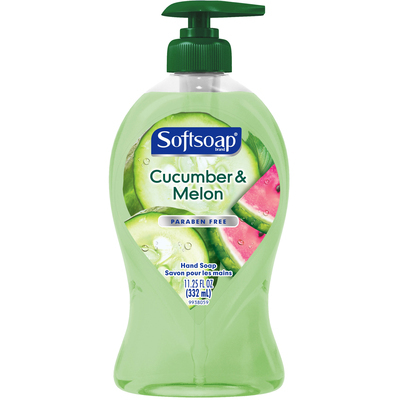 Enjoy Softsoap Cucumber And Melon Liquid Hand Soap With A Delightful Scent Inspired By Sunny Summer Moments: Cucumbers On The Vine, A Garden After A Morning Rain, Freshly Cut Watermelon. Awaken You Senses With This Deliciously Refreshing Clean That Smells Crisp, Green And Slightly Sweet. Wash Away Dirt And Bacteria With Its Gentle Cleansing Formula. Hand Soap Comes In Convenient Pump Bottle For Easy Dispensing.